All transactions are safe and secure with a reliable history in online purchasing behind each of our associates. 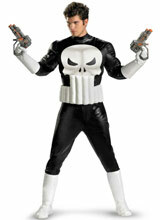 Buy The Punisher Costume to own Punisher clothing and merchandise. Unleash your inner vigilante with this Punisher costume that features a muscle torso with the familiar Punisher skull logo on the chest. Tell your friends that you are an ex-special forces soldier trained to survive in the wilderness by a Native American scout named Phan Bighawk. Wear the costume overtop one of the Punisher t-shirts displayed above. The ammo belt shown in the photo is sold separately and can be found through this gallery. Closed fists are optional. In addition to The Punisher Costume above, browse the Punisher Clothing Gallery for more apparel like men's and women's clothes, kids shirts or hoodies.